Her office has carried out a number of audits and will be issuing guidelines on e-receipts soon. COMPLAINTS ABOUT SHOPS asking for customer email addresses in order to send ‘e-receipts’ have led to the Data Protection Commissioner opening an investigation into the practice. The Data Protection Commissioner, Helen Dixon, has told TheJournal.ie she has concerns about the practice, and has been undertaking audits to see if companies are using e-receipt data correctly. She said in a statement that she is aware of this ‘e-receipt’ practice, and has “undertaken investigative work in this area”. The commissioner has evidence “to show that some data controllers are using email addresses captured for the purpose of issuing e-receipts [and] subsequently using this information to issue marketing material”. Her office has received a number of complaints about e-receipts. The DPC has even been in touch with companies about the practice, and its audit team has “conducted a number of on site inspections which involved a specific focus on the issuing of e-receipts”. What can people do if they have concerns about being asked for their email address for an e-receipt? In essence, a customer does not have to give their email details to a retailer. It is optional and a person can simply receive their receipt in the normal way. However, if they do opt to receive an e-receipt and subsequently receive marketing material without providing consent to receive such material, they may complain to this Office. The DPC is currently drawing together its findings from the audits and investigations it has carried out in relation to e-receipts. It will be issuing a statement on its findings within the next two weeks. The office is also developing guidance in this area which will be publically available this autumn. Companies who issue e-receipts include Topshop, Clarks, Argos, and Shuh. Typically, the customer is asked at the point of sale if they could give their email address so that a receipt can be emailed to them. In most cases, a receipt or proof of purchase is also given to them at the till. Topshop provides a way for customers to access their e-receipt if they haven’t received one, by using a code on their till receipt. 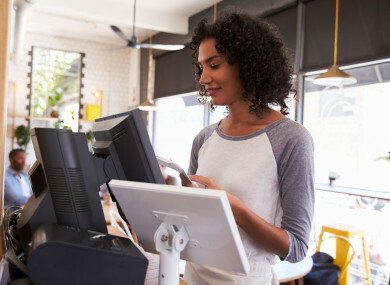 Customers can use their e-receipt in order to exchange or return items, meaning that if a paper receipt is lost, there will still be proof of purchase. An Argos e-receipt seen by TheJournal.ie contained details of the purchase, but also a link to an Argos email sign-up, and a link to a monthly prize draw. We will use your personal information to process your order and may, where appropriate, provide you with exclusive offers, by post, email, text, and telephone, from our group companies and from other companies with whom we work. It advises that the customer may opt-out of marketing communication by phoning its customer advisors on a specific phone number. A Debenhams receipt contains all of the sale details, as well as a link to a short customer service survey. Debenhams has sent you this email using a third party company and the details you provided are solely for the purpose of providing you with your e-Receipt. What do you think of e-receipts? Tell us in the comments. Email “Data Protection Commissioner investigating shops asking for customer email addresses after complaints”. Feedback on “Data Protection Commissioner investigating shops asking for customer email addresses after complaints”.